My name is Wanda Klomp. 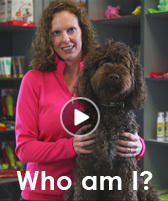 I am a life coach and specialized Labradoodle and Waterdog groomer. About 3 years ago I started a business teaching people how to groom their Doodle professionally, in a natural looking way. Being the daughter of a groomer and dog fanatic in the Netherlands, I grew up living with dogs and having grooming dogs and communicating with dogs as a second nature. Waterdogs are the only breeds that have similar coat structures as Labradoodles have, that are as difficult to maintain as many Doodle coats are. The French Waterdog looks very much like a Labradoodle, but is a very old hunting breed. The Poodle came from the Waterdogs. But Waterdogs are quite rare around the world and Labradoodles have not been around for long, so most groomers do not have the knowledge and experience to groom them. When groomers learn the cutting part of grooming, they learn it on the only other breed with a coat fit for cutting: poodles. But Poodles are groomed in a very stylish way, while Waterdogs need to look as natural as possible. My mother developed a grooming standard for all Waterdog breeds out of old documents and photo's she could find, so when I started learning the grooming business with my mother as my mentor, I learned the cutting part on Waterdogs in stead of on Poodles, like all the other groomers. Because of my mother's reputation a lot of Waterdogs came to the salon to be groomed and soon enough Labradoodles started to come to get groomed, because the owners loved our natural way of grooming. 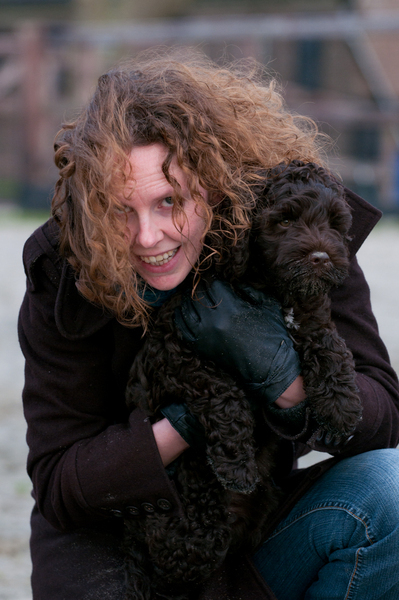 We became the only grooming salon in the Netherlands to groom Waterdogs and Labradoodles on a daily basis. When Labradoodle owners started asking me to teach them how to groom their dog themselves I saw an opportunity to combine my strengths and start a business giving Doodle grooming workshops. I knew that most groomers shave Labradoodles or groom them in a poodle look, because they don't know how to handle the often high maintenance coats. 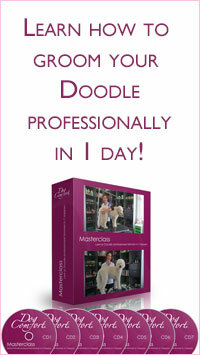 As soon as my website was in the air, Labradoodle owners from all over the country came flocking to my workshops. They were so glad to finally have found someone who could give them the right information on Doodle coat care and they loved learning how to groom them themsleves. I found out that there was a lack of information on Doodle coat care and that nobody really seemed to know how to handle the coats: breeders, groomers and owners were all in the dark. The owners that contacted me often felt helpless, not knowing how to prevend tangles and mats. I decided to take it upon me to give the right information on Labradoodle and Waterdog coat care and grooming. Through the workshops, through my website, Facebook page, blogs and newsletters and through my e-book. I also opened a webshop offering the right grooming equipment, so owners don't spend a lot of money buying equipment that doesn't work on Doodle coats. I called my company Doodle Comfort, because I want to help as many Doodles as possible get the right coat care and lead a happy life. And I want to help as many owners as I can give their Doodle the best coat care. One way for me to do that is to work together with breeders and offer them information on Doodle coat care, so they can give it to their customers. The right Doodle coat care starts with the right information on puppy coat care and puppy grooming habituation, so I have made documents giving tips and info about Puppy coat care, for breeders to include in their puppy packages. But Doodle Comfort is about more then just grooming. Most Doodle owners have not owned a dog before, because of allergies or breathing problems. Now that they have one, they often don't know how to be a leader to them which can cause problems as the Doodles grow up. Doodle Comfort coaches you how to show leadership over yourself and over your Doodle and how to build a strong relationship, based on mutual trust and teamwork. This will benefit you throughout your life. I never knew what I wanted to do with my life and have been searching a long time to find an occupation that fits me. Labradoodles have given me a purpose and direction in my life. I love what I do and feel fortunate that I am given the chance to spend my life helping people this way, spending my time getting to know wonderful people who want the best for their dog and being around lovable dogs that warm my heart every time. I hope to be able to help as many people worldwide give their Doodle the best care possible. And to meet you and your Doodle online or in real time soon! Love from my Barbet Joy and me.